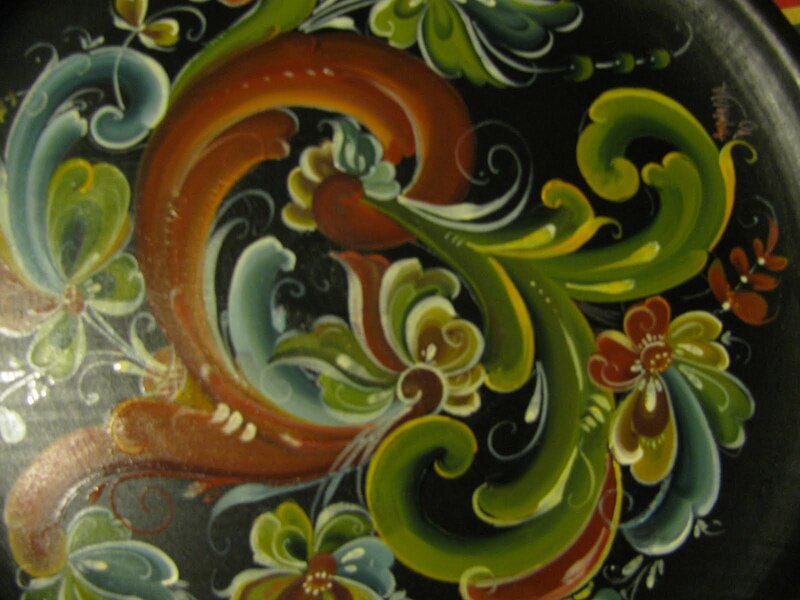 Rosemaling – the traditional painting of Norway! Ah, the joy of painting. So little time and so many pieces of wood to paint…. the folk artist’s lament! 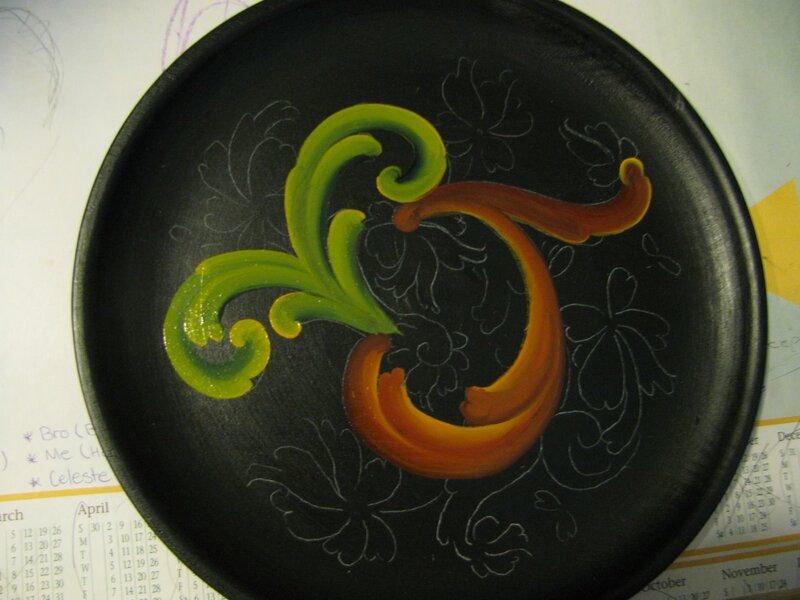 Determined to get something painted this week, I traced a pattern on a base painted plate. I will share a few of the secrets to successful painting here. For the uninitiated, oils are quicker to paint because they blend so easily and beautifully, but take up to six weeks to dry…. On the other hand acrylic paint dries fast, does not give so much coverage and as for blending colours and shading/highlighting in acrylics…. well that has developed into an art form all by itself. It can be difficult to get a gradual blend of acrylic colour, even with chemical assistance such as retarders and various mediums that assist you to work the paint while keeping it open… that is slowing the drying process down. This can be an advantage and a disadvantage. 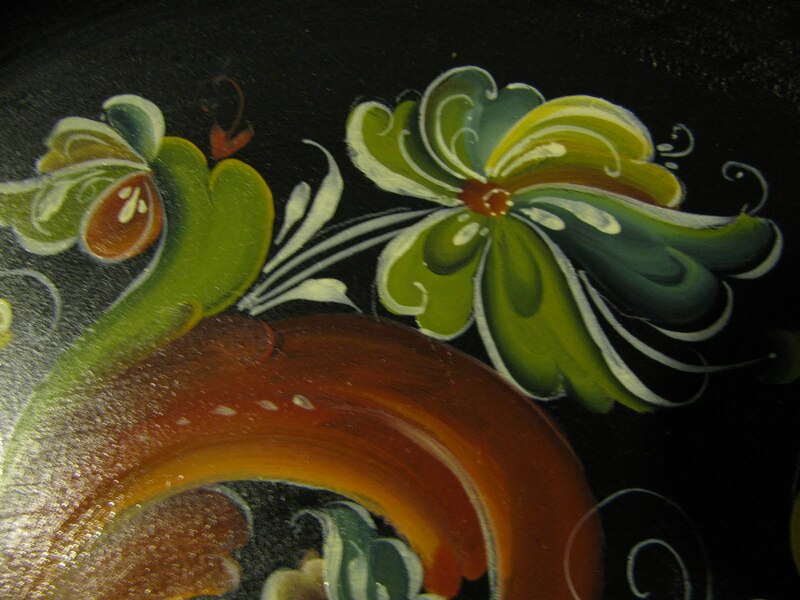 Acrylics can be varnished several days after completion, but can easily develop holes or harsh shading lines. Even using wet -on-wet, you sometimes end up with a muddy mess that is much easier to avoid with oil paints. 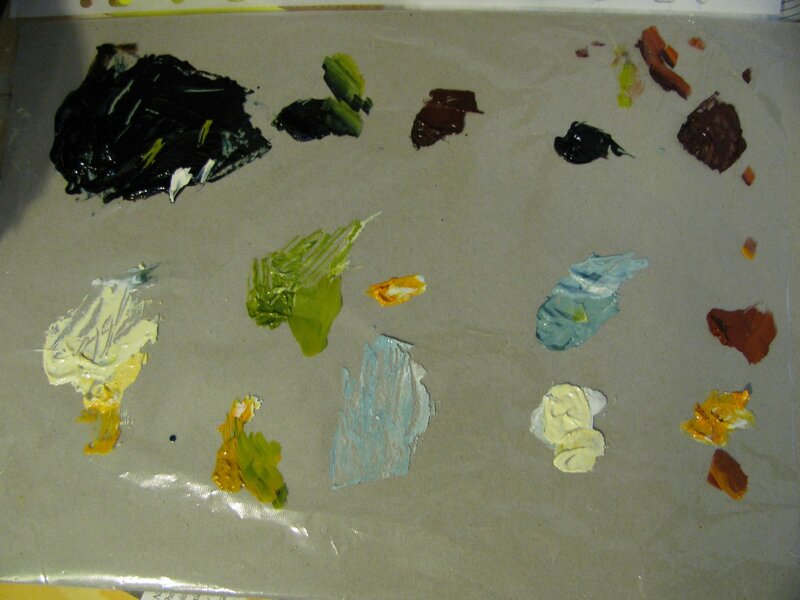 My palette is set out according to colour family, each in the centre row, with respective shades above and highlights below, and of course, the Basic colours on the left. Colour Harmony Choose your palette wisely and don’t be confined by the cool/warm colours of contemporary painting. Bjoerns Telemark Colour families consist of green, red, blue and yellow family colours. He has developed this palette himself and it works wonderfully well in the traditional sense. First I laid in the scrolls, with their respective shade and highlight. It is none too balanced here, but I promise you that will come later. Scrolls are painted with a long handled flat brush in a Pettersen technique. Always paint for balance, so that if you divide your piece into quarters, each colour family will be represented in each sector. 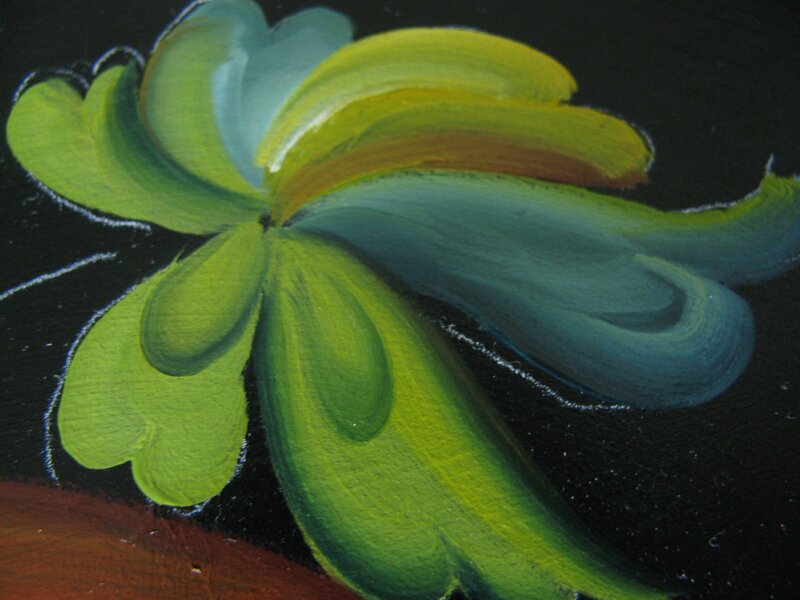 Next step involves the application of paint on the flower and leaf shapes. Aim to not have the same colour family next to each other in painting each petal…. calyx excepted! You can see in the above photo, that I broke this rule, (the rebel that I am inherently am) because I was a little stuck and have 3 greens next to one another, yet it looked OK and was necessary to qualify Rule No. 2 “Balance”. Know when to stop with embellishments!! Now all one has to do, is sign your work, wait for the oil paint to dry and then varnish….!!! Your project is complete.Feel free to contact me with any questions on the comments box below….I hope this blog post has provided some insight into this little known art form, which for me is mesmerizing in its dynamic impact on the eye. Something for painters to ponder about. Thank you! Most informative! 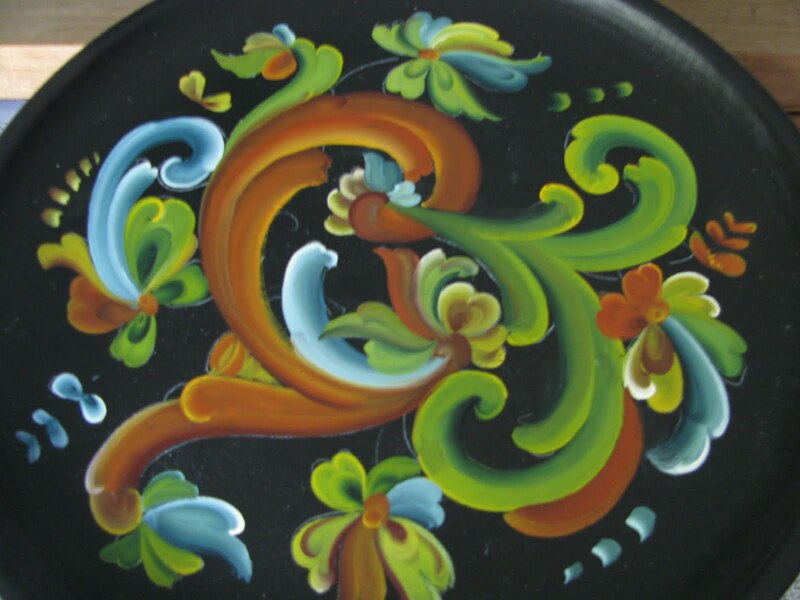 Being half Norwegian, I own a couple of rosemaling pieces. I am interested in taking Norwegian folk designs and incorporating them into quilt patterns. What a great idea Pam! Although it would not be such an easy task to use Telemark style for this purpose. I could definitley see some of the more symmetrical designs translated to quilts such as rogaland or Os. I look forward to seeing some of your projects in the future. So nice of you to stop by. I have added a link on the above posting. 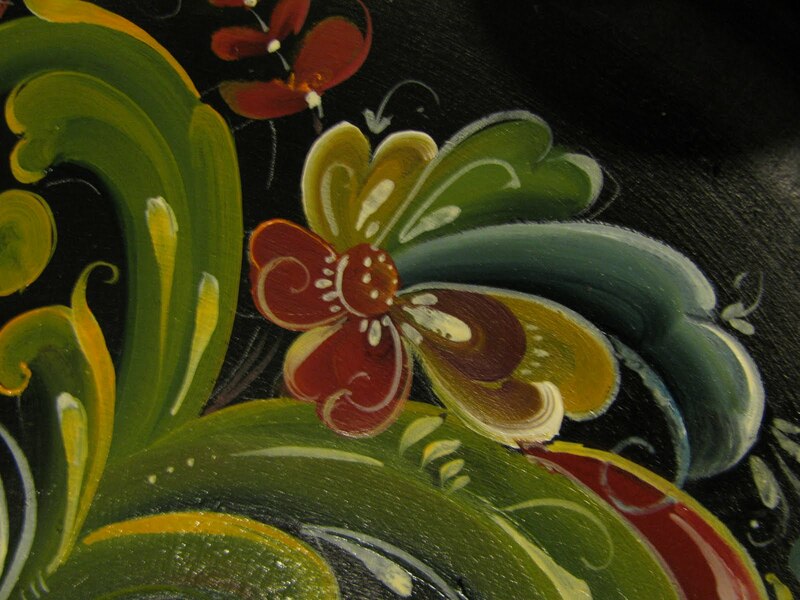 It is a link to the latest tutorial on Acrylic Telemark Rosemaling.